2 What Are Fever Blisters? 3.1 Cold Sores and Fever Blisters: Are They Serious? 3.2 Are Cold Sores and Fever Blisters Contagious? 10 Do Home Remedies for Cold Sores or Fever Blisters Really Work? 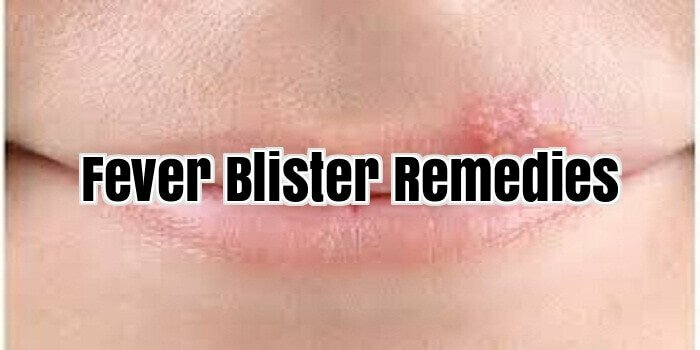 Cold sores or fever blisters as they are sometimes called are suffered by countless thousands of people worldwide. They are caused by the herpes simplex virus (HSV). Some people are lucky and seldom if ever suffer an outbreak, whereas others are less fortunate and suffer repeatedly from the pain and discomfort they can cause. The first signs of a sore developing for many people can be a burning or tingling sensation around the mouth and lips, a sore throat and in some cases swollen glands, usually in ones neck. It is harder as a parent to determine if a young child is about to have an outbreak as they are less specific as to what symptoms they are experiencing, but the onset of cold sores is often associated with dribbling as the sore develops. The actual sores are the result of the reproductive process of the virus, which having entered a healthy cell, causes that cell to replicate the virus. The virus then destroys the host cell, releasing millions of cells in a confined area, which produces what is commonly called the cold sore. 1. Ultra Violet Light – One must be careful not to overdo exposure to the sun. When sunbathing use a suitable sun block. 2. Stress – Either physical or emotional is a major cause because it weakens the body’s immune system causing the virus to become active. 3. Menstrual periods – An outbreak can often be associated with women’s periods. 4. Diet – This plays an important part in one’s general health and consequently your body’s ability to fight off a flare up. 5. Alcohol – Taken in excess, alcohol can rob your body of essential nutrients which can cause cold sores to erupt. To suppress a cold sore outbreak there are several things one can do to assist the body in suppressing the virus. Controlling stress is very important. Avoid emotional conflict and ensure one has sufficient sleep. A diet containing more fresh fruit and vegetables, whole grains, beans and lentils, free range meats and filtered water strengthens the body and provides the nutrients needed by the immune system to function properly. There are countless treatments available across the counter or from your family doctor, for them, producing various results, but now there are extremely effective and fast acting natural treatments available that allow you to get a cold sore treatment quickly and eliminate them forever. If you suffer from unsightly cold sores you should investigate these natural treatments which so many people are now raving about. Medical experts are not sure as to why fever blisters are formed but they are of the opinion that people who suffer from vitamin deficiency and have a low immunity system are more prone to these blisters. Parents therefore should be careful with their young ones and supply them with sufficient fibres, vitamins, minerals and carbohydrates diets which can help them to develop a strong immunity system. Stress, frequent illnesses like cold or flu and over exposure to sunlight can also be a cause for fever blisters and more importantly those who suffer with a weak immunity system are more susceptible to it. Precaution is better than cure. So the best way to get rid of fever blisters is to avoid getting them at all by being careful about your diet and leading a healthy life so that if you do fall a victim to a fever blister you will be able to come out of them soon. How to get rid of fever blisters can be a cause of anxiety but the way to prevent it is to avoid coming into direct contact with one who has it by refusing to share utensils, linen or other items that may transfer the virus from one to the other. Studies have shown that application of sunscreen on the lips can also prevent fever blisters. L-Lysine is a supplement that may help you to get rid of fever blisters. Also avoid taking chocolates and nuts as these can aggravate the disorder of fever blisters. A vaccine to help in getting rid of fever blisters is on its way soon so till then nothing can be more helpful than precaution itself. The HSV-1, or the herpes simplex virus, is the primary cause of cold sores and fever blisters—both of which are the exact same condition that affects the lips. The medical term for cold sores and fever blisters is ‘herpes labialis’. However the word ‘labialis’ is not be confused with genital herpes, which uses the same etymology for the labia of a female’s genitalia. Though rare, cold sores and fever blisters can spread on and around the mouth. And in most serious cases, cold sores and fever blisters swell out over the face, which is called ‘orofacial herpes’. Cold Sores and Fever Blisters: Are They Serious? The first question that runs your mind when you think about cold sores and fever blisters is whether or not these conditions are serious. They can be. But most of the time, cold sores and fever blisters remain latent for years before showing any symptoms. And when you do find cold sores and fever blisters, chances are they will disappear within two weeks. Cold sores and fever blisters are recurrent, as the virus causing it stays in the skin around the mouth. The condition usually comes and goes. Throughout a year, a patient may experience up to a dozen or more recurrences of cold sores and fever blisters. Fortunately, most patients with cold sores and fever blisters don’t have to go through it all. In less serious cases, cold sores and fever blisters stay dormant and only occur 5 to 10 days, once or twice annually. Are Cold Sores and Fever Blisters Contagious? Apparently, over 64 percent of adults in the U.S. have this condition, and that doesn’t yet include teenagers who have the herpes simplex virus dormant in their systems. And yes, cold sores and fever blisters are contagious. As a matter of fact, STDs don’t even come close to how infectious this condition is, because cold sores and fever blisters can be contracted with just a single touch. Instantaneously, the virus can get transferred to the next person’s hand. If that virus somehow comes in contact with an abrasion on the mouth, specifically the oral mucosal tissue, it will initiate the infection and this person will start to develop cold sores and fever blisters. Even when the herpes simplex virus stays latent underneath the facial skin, it still infects that area. It doesn’t always mean that you have to keep your distance from someone who has cold sores and fever blisters, but you still have to be very careful so as not to touch the infected area. The risk for contracting cold sores blisters is very high. More often than not, a person already has it unknowingly. It’s even harder to back track steps and figure out from whom he or she got the herpes simplex virus. In order to fully protect oneself from catching this disease, one should consult with the family physician whenever he or she comes in contact with a person infected with cold sores blisters virus. Getting cold sores or fever blisters in and around the nose and on other parts of your face can be more painful than the ones that generally appear on the lips and around the mouth. The cold sores or fever blisters in and around the nose are similar to those that appear on your lips and mouth. They swell and form blisters which erupt, produce scabbing and finally heal, usually leaving no scars. This is called nasal herpes. Basically, the virus goes through the same stages that oral herpes goes through; that of the ‘prodrome’ stage, the ‘weeping’ stage and the ‘healing’ stage. The ‘prodome’ stage consists of feeling a burning or tingling feeling followed by a formation of a cluster of small blisters at the site of infection. Next is the ‘weeping’ stage when the fever blister starts to ooze and crust over into a scab. Finally, in the ‘healing’ stage, the cold sores or fever blisters in or around the nose scab or crust over and are replaced by fresh new skin. The cold sores or fever blisters in and around the nose can be a result of autoinoculation, where you actually spread the virus from one area to another yourself. Cold sores are highly contagious. Picking your nose when you accidentally touch an active outbreak of a cold sore is one way of transmitting the virus to your nostrils. Being conscious of what you touch and where your hands have been will help avoid spreading the virus to other parts of your body. Washing your hands often with soap and water will also help prevent autoinoculation. The cold sores or fever blisters in and around the nose can get really irritating and extremely painful particularly if you have the flu or a cold at the same time. The conditions inside the nose, being moist and warm, make the virus thrive which can increase its chances to infect nearby areas and can lead to a longer healing time than usual. They are aggravated every time you try to blow and wipe your nose as it is nearly impossible to avoid the sores. When the scabbing stage begins, the crusting becomes hard due to the constant flow of air in the nostrils. This means the scabs can easily break and bleed with just a movement of your nose. The skin in the nostrils is fragile and thin which increases the possibility of the scabs breaking and bleeding easily. This can promote further infection of the virus. Applying home remedies like placing ice on the nose can help relieve the pain of the cold sores or fever blisters and can speed up the healing time. Taking L-lysine can also shorten the duration of the episode. Having cold sores or fever blisters on any part of your face is unpleasant enough. But having cold sores and fever blisters in and around your nose could possibly be the worst. However it may be possible to stop a cold sore or fever blister in and around the nose before it starts. Considering more than half of the world’s population carries the herpes simplex virus 1, there are definitely needs for fever blister remedies. It doesn’t take much for the virus to move itself from one host to the next. The infection of a person comes from making contact with another person carrying the virus. Many times, all it takes for virus transfer is for people to share saliva, whether it is through kissing, or sharing a drinking cup or eating utensil. People carrying the virus that causes fever blisters should take precautions so that they don’t spread it to others, including family members and co-workers. The areas they usually transmit from include the lips, eyes, and ears. People must avoid scratching or even touching those infected areas. If there is a need to physically relieve an itch, use a cotton ball or preferably a small cotton swab that can be promptly discarded. It would be nice to wrap the cotton swab in a tissue so know one accidentally touches it during trash can dumping. Contacting others orally is an obvious no-no. This contagious virus would easily and quickly transmit to the next person. Those items used for consumption of food and drink need to be cleaned thoroughly, and using some antibacterial cleaning solution would be best. A technique people can opt to use as a fever blister home remedy is an age old tradition that may seem primitive, but it is effective. Many people have seen improvements in their recovery when they apply toothpaste to the location of the blister. The amount needed depends upon the severity of the cold sore. When using toothpaste, cooling and numbing sensations come about from the paste ingredients. The sensations reduce and relieve the pain and itching as the blood flow increases to the fever blister, sending a more rapid supply of white blood cells. For the toothpaste, its active and inactive ingredients which include baking soda, enzymes, and such will help kill germs and bacteria in the immediate area. Determining early that the virus is bubbling up will greatly aid in treating and reducing the severity of the fever blister. Some of the warnings for an onset of a cold sore include itchiness, slight warmth, and even a bump forming on the skin. When detected, clean, disinfect, sanitize, and apply toothpaste to the location. Try to apply the paste evenly with a cotton swab, and do this in the morning and before laying down for bed. The fever blisters will eventually heal. Use sunscreen on a sunny day as a preventative measure if a blister isn’t present. Since the herpes simplex virus 1 cannot be cured, numerous tips including the previous few need to be taken as fever blister remedies, or at least, preventative measures. Detecting the virus early can be a great weapon and so is educating those who are most susceptible around you. If you can prevent a cold sore, you won’t have to worry about the multitude of fever blister remedies. Some may think fever blisters remedies to be a tale but it is actually a reality to others. When using fever blister remedies on lips or any other varieties of canker sores it truly is vital you take safety measures on what ingredients you applying on your mouth sores. Should you be not cautious of the fever blister remedies used you might make your cold sores a lot more uncomfortable and painful. When you are infected with fever blisters, you must avoid foods like grains, peas, peanuts, chocolate, oatmeal and whole-wheat products. Below are 6 effective fever blister remedies you can refer to. 1) The easy fever blister remedies are to always maintain the fever blisters clean and dry. Don’t try to cover them up with cosmetics as performing so will only worsen the fever blisters. Other than that, covering up with thick layers of foundation is not effective as well. 2) Applying fever blisters area with petroleum gel will speed up the recovery process, stay away from cracking, bleeding, and try to reduce spreading. Apply lip balm as fever blister remedies that proven having sunscreen protection will help to avoid making the fever blisters worsen. Take note that most of the times fever blisters attacks are caused by long duration of sunlight exposure. 3) One of the fever blister remedies is putting tea bags and ice on fever blisters will help if reducing the pain and soreness, and also minimize the inflammation. Tea contained Tannic acid that has natural anti-viral elements that can assist to fight the fever blister virus. 4) Other fever blister remedies include taking lots of lysine foods and keep away from those that are either high in citric acid or high in arginine. Lysine stops the fever blister virus from replicating and on the other hand arginine keeps them alive. Try to eat more dairy foods and potatoes that are major sources of lysine. Steer clear of or do away with arginine sources like whole grains, peas and chocolates. Acidic foods are verified to hasten and worsen fever blister, so reduce taking citrus fruits will definitely help. 5) Some herbs such as sage and aloe Vera are commonly used and extremely helpful. Just putting few drops of the extract and waits for the anti-viral elements to work on the fever blisters. This is one of the natural fever blister remedies. 6) Of course, the most easy fever blister remedies are to visit clinic or pharmacy and ask for doctor-prescribed medicines to put to your fever blisters. Practically all of them alleviate the pain and soreness caused by fever blisters. Nonetheless, although some anti-fever blister medications tell you that they are able to cure your cold sores permanently, don’t anticipate it to really do. Bear in mind that the fever blister virus normally stays inside the nerve endings for a long period. Other than keep looking for fever blister remedies, the best way to defence against it is to find out what actually cause your fever blister attack. The causes are different for every individual. When in search of fever blister remedies it is ideal to first check for basic solutions that you simply can apply with natural resources that can easily found within your home. Performing this will most likely save you a trip towards the grocery shop. Many people have apple cider vinegar in their dwelling hence you might need to begin with those fever blisters remedies initially. This fever blisters home remedies are easy to apply and very inexpensive. However a lot of time the fever blister remedies suggested above is not good enough for some individual who have more severe fever blisters. Home cold sore remedies are desired as a way of preventing the flare-up of fever blisters. This would prevent the need to continually purchase over-the-counter or prescribed medications in order to keep treating the problem. This is necessary as there is not a cold sore cure. The onset of a cold sore can be detected ahead of time if you train yourself to be aware of the warning signs. Some of the common indicators of a developing cold sore include itching, tingling, and warmth at the location that will become a fever blister. This period of time usually lasts several hours and provides a period of time where precautions can be taken. During this time, it is highly advised to not touch this area. To touch or scratch the area will act as a catalyst for the herpes virus to travel to other areas that will be touched. If the overwhelming urge to scratch or clean near the area can’t be overcome, you should clean the area with an anti-bacterial solution, and wipe the area clean with a disposable cotton ball or swab. It would be great to not have to go through this, and that is why we should take full advantage of proper nutrition in order to reduce cold sore occurrences. If you have a good home cold sore diet, you can make the herpes simplex virus dormant. A good diet and exercise program should be followed to suppress the virus. The changes you make in your diet to improve the alkaline content in your body is what puts the virus in a dormant state. Making these positive changes in your diet for a lifetime can lead to never seeing that cold sore in the mirror again. The herpes simplex virus 1 needs an acidic environment to thrive, and in this state it is hard to suppress outbreaks. Balancing your diet between acidic and alkaline foods in the proper proportions will lead to significant reductions in the outbreak of cold sores, as it usually makes the virus dormant. Home cold sore remedies are great, but consult a nutritionist on how to go about implementing some of these changes to your diet. There are food choices that should be reduced or eliminated altogether in order to succeed with this method. Foods to avoid include high fat dairy products, margarine products, saturated fat foods, mayonnaise, junk food, artificial sweeteners, chocolate, etc. Various kinds of preservatives used in food also help trigger outbreaks, so focus on natural, least processed foods. High fibre foods are good for the heart, increase the metabolism, have low acidity, and are usually all natural. Avoid those acidic foods to avoid cold sore outbreaks. Water, milk, and juices are excellent drinks to stay hydrated, but be sure to reduce your caffeine intake. Make your food choices your home cold sore remedies, and stop suffering from fever blisters. Once you get a fever blister, you will experience pain, numbness, burning and tingling around your mouth or lips. Before you figure out how to get rid of a cold sore, the infected skin around your lips will turn red. After 4-5 days the red skin will turn into yellow crust. This usually means that your cold sore should heal in about 8-10 days. Don’t touch your blister – The first tip on how to get rid of fever blisters is to keep them from spreading by not touching the infected skin. Touching the blisters frequently will only add infection to your cold sore. And scratching them for getting rid of cold sores will only harm your skin. Lastly, one of the main reasons why you should not touch your cold sore is to avoid spreading the virus. Touching your fever blisters and making physical contact with your friends and families will only put them at risk of getting them too. Keep it clean – How do you get rid of a cold sore and the associated pain? Simple – you can ease the soreness by using soap and water. Rub the soap smoothly into your fever blisters then wash it off. But make sure that the soap will not be used by others to avoid cross contamination. Cleaning your fever blisters once in a while will also help lessen the bacteria around your mouth and prevent further infection. Apply a cream – There are creams that contain zinc oxide, which has been said to lessen the outbreak of fever blisters. Some creams require prescription but there are also over-the-counter creams for getting rid of a cold sore. Creams can also alleviate the pain and tingling of fever blisters. Consult your doctor -If you’re really bothered and want to make sure that you’re doing the proper thing, it is best to ask your doctor how do you get rid of cold sores. Getting a check-up will help you to know the cause and treatment for fever blisters. You can also ask your doctor if he or she can prescribe antiviral medicine or creams to heal faster. The above steps are just some ways how to get rid of cold sores – there are still many others. Just make sure that you take note of the signs and prevent the spreading of the virus. Some remedies can sooth the pain, reduce the area affected, and speed up the healing process, cutting short the duration of the visible sore. One of the most common remedies, and possibly the cheapest, is treating cold sores and fever blisters with ice. A lot of cold sore sufferers testify to the amazing effects that treating cold sores and fever blister with ice has on their outbreaks. Sometimes ice can even stop the virus from turning into a full-blown occurrence. To accomplish this you need to take action immediately at the first sign of an oncoming outbreak, also known as the ‘prodrome stage’, when you get that tingling or itching sensation. Treating cold sores and fever blisters with ice involves putting an ice pack on the area affected and holding it there for a few minutes and taking it off occasionally if it gets too painful. Do this for about 10-15 minutes every hour or more, if you have time. Doing this in the early stages of an outbreak reduces the virus’ metabolism, discourages its reproduction and can eventually push the virus back into hibernation. Treating cold sores and fever blisters with ice is a fairly effective way to stop a full-blown outbreak. The results may vary from one person to another. In the event that it continues to develop, continue applying ice on the area to help ease the pain and to stop further swelling. This will also make the cold sore go away faster than usual. Treating cold sores and fever blisters with ice can produce remarkable effects on its own. And if used with other treatments, it can produce better results. Frozen tea bags are an example of a treatment with ice incorporated in it. This treatment provides the soothing effects of ice and increases the potential of suppressing the cold sore virus. Tea contains natural anti-viral properties that can be used as an organic remedy for cold sores or fever blisters. Another combination that many sufferers find success with is; ice followed by rubbing alcohol. This dries out the sore and keeps the area sterile. There are many other home remedies for treating cold sores or fever blisters that sufferers have used with varying degrees of success. Using ice as an inhibitive measure and in combination with other treatments for cold sores or fever blisters is fairly effective. However treating cold sores or fever blisters with ice is still treating an outbreak. A more effective solution would be to stop the cold sore before it starts. Do Home Remedies for Cold Sores or Fever Blisters Really Work? Do home remedies for cold sores really work? Curing cold sores is difficult, if not next to impossible. No treatment works for everyone. One person will have good results with a remedy and another person will say that it doesn’t work for them. In addition there are differing strategies. One approach is to try and dry the sore. Another approach is to keep it moist and deprive it of oxygen, and still a third is to dry it out and then keep it moist. In addition, there are other preparations that are normal house hold supplies that do not fall into either category, with examples of how they could be used. Do home remedies for cold sores really work? The method of drying out the sore involves applying some sort of astringent to the site. There are many different products that accomplish this. Most of them contain alcohol or a solvent that dries out the skin. Here is a partial list, starting with the most logical and proceeding to the hard to believe. Most of the time one would use ice and/or open the blisters with a needle before using these products. Drying the sore is probably a better strategy than keeping it moist. Almost all of the over the counter preparations keep the area moist. Usually this is not effective in shortening the episode. Next is a partial list of remedies that don’t really fall into either category. They are reported to be helpful in treating cold sores. Most of these home remedies are reported to shorten the episode, but again they focus on applying something to the sore after it has already started. So the best that can be expected is to shorten the healing time and perhaps relieve some of the pain. But be aware that some of them actually increase the pain.